Brought to us by One Off Hospitality Group who also owns The Publican, The Violet Hour and Blackbird, you just know you’ll be in good hands when dining at Dove’s Luncheonette. This retro diner, located in Wicker Park, is serving up some really delicious Southern-inspired Mexican fare. I loved the low-key retro diner feel of the space with the wood paneled walls and counter-style seating. It’s very cozy! We dropped by for brunch on a Saturday around 11am and grabbed the last two seats. They are open every day in the morning and into the evening and while they have a few reservations available throughout the day, they don’t accept any for brunch on weekends. The brunch menu consists of small plates ($6-$11) including chili verde and whitefish dip and larger plates ($10-$16) which include Mexican-inspired dishes like enchiladas and pozole rojo as well as more typical American breakfast fare like avocado toast and burnt ends hash. For $1, you can add a fried egg to anything. With a menu filled with Mexican fare, I decided to venture out of my comfort zone (i.e. 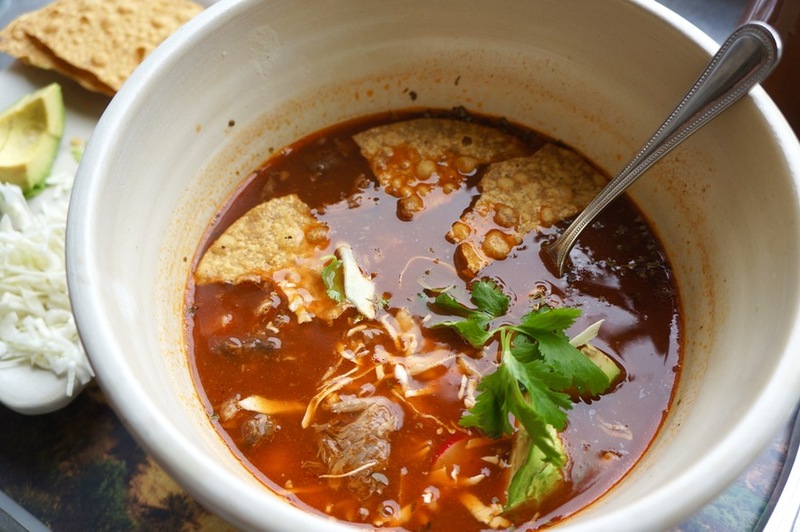 skip the avocado toast) and ordered the Pozole Rojo – braised beef cheek in a guajillo chile broth with hominy, avocado, cabbage, cilantro, radish and crispy tortillas ($13), which our server described as Mexican pho. It was incredibly comforting and was the perfect dish for the middle of winter. The spicy broth was served with a side of cilantro, cabbage, lime, avocado and crispy tortillas which you could toss in for added texture. The pozole had chunks of soft braised beef in it which made for a surprisingly filling meal. Mike ordered the Chicken Fried Chicken – buttermilk fried chicken smothered in chorizo verde gravy with sweet peas and pearl onion ($16), one of Dove Luncheonette’s most popular dishes. 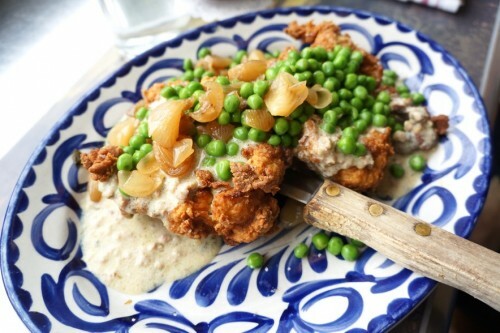 The two pieces of fried chicken were incredibly crispy even though they were smothered in that delicious sausage gravy. I also loved the addition of the sweet peas and pearl onions which gave the dish additional pops of flavour. Unless you’re a vegetarian, there’s no reason why you shouldn’t order this. 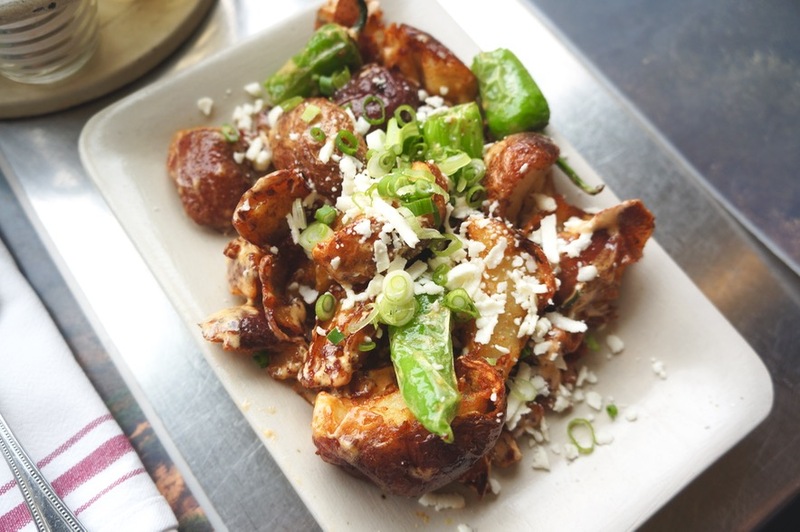 We also shared the Pepper & Potato Hash – fried potatoes and shishito pepper with cheddar cheese aioli, scallions & queso fresco ($9). At $9, the price point might seem a bit high for a side dish of potatoes but I assure you, it was worth it. These fully loaded extra-crispy potatoes were sprinkled with shishito peppers, queso fresco cheese and a delicious aioli. Needless to say, brunch was excellent. Most of our meals in Chicago were in the West Loop neighborhood so it was a nice change getting out of that bubble. We walked off our meal in the Wicker Park area, exploring all the cute little shops on Damen Avenue. 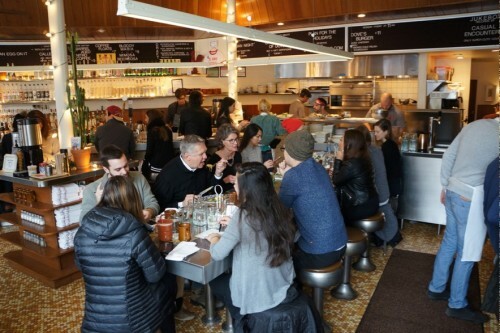 So for those of you in my (tourist) shoes, Dove’s Luncheonette is worth a visit!